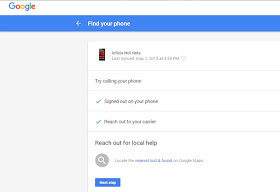 You can now find your lost or stolen Android phones whichever location you are residing. Before now, finding stolen or lost phone has been with the use of Standalone Android Device Manager Application. But now, the very good news to all android users is that, Google has come up with what I call "A lost and found mission" As you can now find the details of your device location and not only that, you can as well make the phone to ring at its peak volume, so as to locate it immediately with that enabled ability, and with Lot's of more. Read on for that. √ RECOMMENDED: Learn How to Enable Hibernation Mode on Windows 8 &10 Operating System. Next, click on the particular Android device you wish to find its location details. From the options available there, choose the method in which you wish to find your android phone. Now, explore any of the given options above on the app, just to make research/findings of your phone where about. √ READ ALSO: How to Use Picture As Password on Windows 8. TIP: Do make sure, that your own location is turned on always, in order to enable this Android Device findind service, work for you. With out being told, this should let us know that, the rate of loss or stolen phone will definitely reduce. What do you think about this development? You can always use our comment box below to express your self. Don't hesitate to share this post to your friends in need. Sharing this can go a along way in helping someone out there. Thanks.